Richard’s career in financial services started in 2004 when he joined Aon, the world’s largest Reinsurance Broker. During his time there, he realised he had a prowess for statistical & actuarial analysis and eventually became Aon’s UK Management Information Specialist. Having worked in business analytics for a number of years, he found his way to IT Service Management and progressed in the organisation in various Service Delivery roles eventually ending up as the Head of IT for a joint venture between Aon and the London Insurance Market’s largest service provider. Whilst in this role, he drew on his financial management experience and reduced operating costs by 30% PA whilst also increasing annual revenue by 65%. He achieved this by undertaking a number of international assignments and finding solutions to some of the organisations most challenging operational problems. 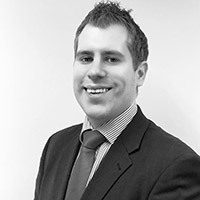 In 2013 he decided to leave IT and return to the operational side of Financial Services by joining the family firm; Richard became a fully qualified adviser in the same year. He is also a Member of the London Institute of Banking & Finance and holds qualifications in Project and Service Management. During his spare time he enjoys spending time with his family, trying to play the guitar and watching the mighty Chelsea.